Mary Oliver, winner of the Pulitzer Prize and National Book Award, is one of the most celebrated poets in America. Her partner Molly Malone Cook, who died in 2005, was a photographer and pioneer gallery owner. 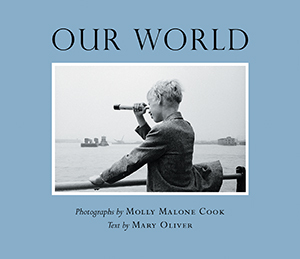 Intertwining Oliver’s prose with Cook’s photographs, Our World is an intimate testament to their life together. The poet’s moving text captures not only the unique qualities of her partner’s work, but the very texture of their shared world.